Grand Canyon combines geological immensity, depth, and a palette of rich colors that has no equal on the planet. There’s a good reason why millions of visitors take hundreds of millions of pictures at Grand Canyon National Park. Aside from being one of the world’s most beautiful places, it is where even a simple snapshot can look like a postcard. You can thank nature for that. But for inside tips on turning ordinary Grand Canyon images into works of art, you can thank Eric Lindberg, a two-time winner of the prestigious Photographer of the Year award given by the Society of American Travel Writers. The travel photographer and writer has been widely published in magazines, books, tourism publications, and online publications across North America and overseas. Here, he shares his advice on capturing Grand Canyon in its best light. Q: What is it about Grand Canyon that makes it worth shooting? A: Oh, so many things… Grand Canyon combines geological immensity, depth, and a palette of rich colors that has no equal on the planet. The scenery changes with the light, with the seasons, and with weather. And there are countless viewpoints and vistas where you can shoot. Just walk 50 feet and you’ll find the scene is completely different. Q: How do the seasons affect the texture and appearance of Grand Canyon? A: In a variety of ways. It starts with the angle of light which changes each season, from the low light of winter to the overhead light of summer to fall and spring when it falls everywhere in between. Winter snows can frost the canyon and soften it. In the summer, monsoon rains bring dark clouds, lightning, and dramatic skies. Q: Say someone arrives at Grand Canyon without a “real” camera. What’s your best advice on taking pictures with a device like an iPhone or iPad? A: I’d recommend they get as close as safely possible. If your phone camera has a panorama mode, try to capture a sweeping view of the canyon. Be sure to hold it still, which can be tricky since the light weight makes it susceptible to movement. And if the sky isn’t interesting, like on a day with no clouds, just tilt the phone angle down to reduce the amount of sky in the photo. On phone cameras you’ll generally get a sharper photo if you don’t use the zoom, which isn’t very good on a phone anyway. For a more “close-up” view, just crop in later. Otherwise, follow the same rules as you would with regular cameras by being aware of lighting, composition, and so on. Q: And if they arrive with a camera I’d call a “real” camera or “professional” camera, what accessories would you recommend? A: A tripod is useful for slower shutter speeds and low light. In hazy conditions, a polarizing filter can help cut down glare and is also useful to soften the scene during the harsher light of mid-day. Q: One thing that’s always puzzled me is seeing people walk to the rim, take a few pictures, and leave. What would you say to convince them to stay longer? What advice would you suggest so they really see Grand Canyon? A: That one gets me, too. Any deep, true relationship lasts longer than a few minutes. Grand Canyon is no exception. 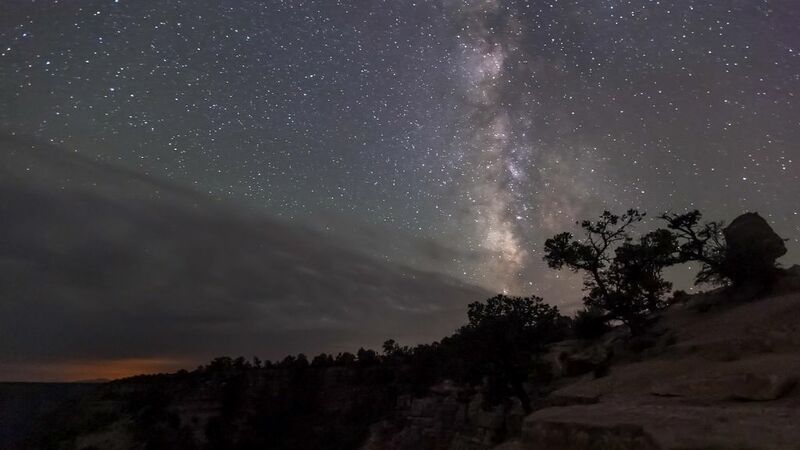 If you truly want a deeper experience at Grand Canyon, spend the night there. Walk along the rim during sunset and sunrise. Listen to the sound of ravens, of the wind blowing through the canyon. The longer you linger and look, the more you will see. As the sun comes up and the sun goes down, the colors, shadows, and light will shift continuously, revealing the canyon in many moods. Q: It’s easy to find a favorite photo spot that you shoot over and over, but what suggestions would you offer to capture more variety? Go at sunrise and shoot until the light goes flat and harsh; you’ll enjoy the quiet of those early hours — and you’ll be surprised how empty and quiet it is. Often the canyon is there for you alone. Around mid-afternoon you can go back and shoot until the light is done. Move beyond the crowd. Look for new angles. Try different focal lengths or lenses. Shoot wide to capture a large portion of the canyon, then zoom in or change your lens to isolate features in the canyon. Look for interesting formations, colors, or angles that catch your eye. Find foreground elements — like a plant, a cactus, tree, or a rock — anything to catch the eye and take the viewer from foreground to background. Place those in the picture and it makes the photo more interesting. The dimensions of the canyon can get lost without a point of reference. Place a person in your photo to give it a great sense of scale and let the viewer see just how immense the canyon is. And if you have that person wear bright colors — reds, oranges, yellows, for instance — that will help set them apart from the earthy tones of the surrounding scenery. To capture the sharpest possible image, keep your camera steady by using a tripod, or by bracing yourself against something stationary, or holding your camera steady as you gently press the shutter button to reduce camera movement. Q: What’s your favorite time of day at Grand Canyon? A: Well, different times of day deliver different results. When I want to catch the soft, warm light photographers call “Magic Hour,” I’ll head to the rim in the early morning from just before sunrise and stay for the next two to three hours. I’ll return later in the day when the sun is lower in the sky. I’ve also found that photographing the canyon just before or after a storm passes can produce very dramatic skies. I’ve also been there right after a snowfall, which is a magical time not many visitors get to experience — but they should. Q: Where do you go to find the best pictures? A: The South Rim is the most visited side, of course, but the North Rim offers completely different views. But on either side I always resist the temptation to photograph from a place where everyone else is standing. It’s so simple to just walk away and find other pleasing angles. Q: Grand Canyon is only a fraction of the wide-open American Southwest, which is just as beautiful in its own way. What is it that makes this region such a great place for photographs? A: The simple answer is that the American Southwest is unlike any other place on earth. A person could spend years exploring the hundreds of square miles of red rock canyons, arches, towers and spires, and exquisite geological formations across several states, and not come close to seeing all there is to see here. The geographic diversity, the colors, the textures and shapes are a photographer’s dream. Grand Canyon National Park Lodges provides the premier in-park lodging, managing six distinctly different lodges. 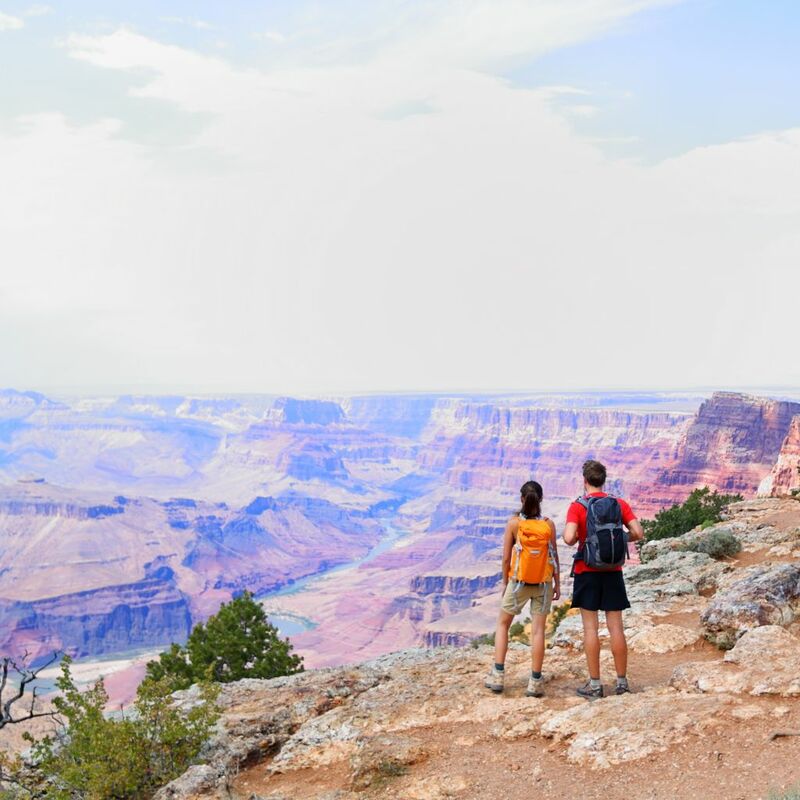 From the El Tovar Hotel, long considered the crown jewel of national park hotels, to Phantom Ranch, the only lodging on the floor of the canyon, you’ll find accommodations to help you get the most out of your visit to the Grand Canyon. You can also book rafting, railway, and motorcoach tours. For more information and reservations, visit grandcanyonlodges.com or call 888-297-2757. Or consider the 10-day “Bryce, Zion & the Grand Canyon” tour from Holiday Vacations, one of America’s most reputable tour companies with more than 44 years of experience. As a nationwide provider of air, rail, motorcoach and cruise guided vacations to more than 65 destinations worldwide, their packages are inclusive of all airfare, fine hotels, meals and must-see attractions. Expert tour directors handle all travel details, assuring you a carefree and memorable vacation. Visit HolidayVacations.com for more information.